The news today about Lance should be no surprise. My feelings on that topic are mostly “Finally people are going to have to pull their head out of the sand”. I do have some strong and conflicted emotions about the news that comes along with it. Along with USADA’s statement on Lance was an admission to doping by 10 other cyclists from that era. Frankie Andreu, Michael Barry, Tom Danielson, Tyler Hamilton, George Hincapie, Floyd Landis, Levi Leipheimer, Stephen Swart, Christian Vande Velde, Jonathan Vaughters and David Zabriskie. All are being hailed as heroes today for ‘coming out’ and doing the right thing. Six of those cyclists have continued to race for the 7 seasons between Lance’s last win and today. They earned a lot of money, and won a lot of races after doping. All of their statements say that they went cold turkey on drugs in 2006, but the physiological benefit to having doped at some point in the past was never erased. Aerobic fitness, the thing that wins bike races, and the thing that doping improves is incremental. It takes years and years to build a body capable of riding a bike fast. I didn’t stand on the podium this season based on the work I did this summer, I earned my results in 2012 by training for them beginning in 2006 when I began cycling. Today’s ‘Heroes’ are not heroes. True, they are doing the right thing today, but they were complicit in the problem between 1998 and 2005 and they have been reaping the benefits of their involvement for all of 7 intervening cycling seasons. These men have won races for themselves and their team-mates using physiology that they did not earn (Cadel Evans’ 2011 tour was piloted by G.Hincapie, T.Danielson won a stage in Colorado this year, M.Barry has been a very powerful domestique for team Sky in various stage races over the years, D.Zabriskie has won many TTs over the years including driving Garmin to a stage win in the TTT in 2011, Levi has won the tour of California twice amongst many other big wins, and Christian VandeVelde has factored in the top ten of the TdFrance and won in Colorado this past year. These are hardly the palmares of a bunch of average pro-tour cyclists). True, if they’re not doping now it’s only a lingering effect, it was only a few percent in 2005, and it’s probably only a fraction of a percent now, but my sport is a sport that is all about fractions of a percent. The first time I got on the Cat 1/2 podium it was by less than one one hundredth of a second in a race that lasted close to four hours. Our Olympic Champion this year was cut from the same cloth, he wasn’t on very potent drugs this year to win that race, but his physiology is largely defined by periods of his career when he was. What do we do with all of these icons? Do we kick them all out? Do we hand out 6 month suspensions (as sources indicate is what will happen) and let them come back and continue to use their advantage over the clean peloton to their advantage? I don’t know. Some of these guys may *actually* be ‘victims’ of the US-Postal doping conspiracy. I do know that if the long term goal is to have races like the tour de france start with 180 riders using their God-given talents and the fitness that they have earned through sweat and tears… then it’s absolutely necessary for there to be complete visibility in the global cycling community, spearheaded by the UCI (or what becomes of it), that it is believable that others are not doping. How does the international cycling community start moving in that direction? I think it’s absolutely going to require a Truth and Reconciliation commission as has been proposed but so far shut down by the UCI. Credibility and honesty isn’t something that can be requested, it is something that needs to be earned. Unless there is real effort (and money) directed towards capitalizing on an opportunity for a cultural shift it’s not going to happen. I think that a truly clean Tour de France is probably more than 20 years away. There are cyclists right now who are breaking in to the pro ranks in their late teens who are cheating and it will take until their late thirties before they’ve retired. Are we ready to make changes that are going to take at least a generation? I hope so. I remarked on twitter that this was by far the most challenging thing I’d ever done. The hardest day, stage 3, which had me worried for my wellbeing was impacted largely by mental challenges in addition to the physical. That said, it was the most physically demanding ride to complete that I had ever done. It would later be surpassed by Stage 6 which was completed with relatively fresh legs after a day of recovery. A number of people have questioned whether or not it’s possible that these rides were so much harder than all of the ridiculous ideas that I can think up for myself at home. The answer to that question is both “Yes” and “No”. I’ll illustrate with a couple graphs to compare. 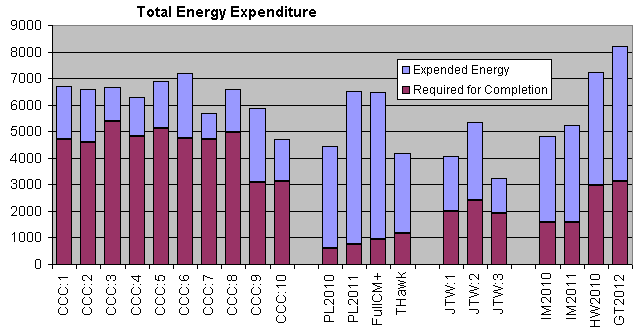 The first is a chart showing the energy expenditures for each day measured in calories. These are calculations, but they are calibrated calculations and quite accurate, especially relative to one another. Included is how much fuel (food) must be converted into actual cycling motion. This does not include general bodily functions, the demands of thermo-regulation which are very large when your body is displaying symptoms of hypothermia, and does not include the body’s activity of muscular recovery running overdrive all night long between the stages repairing some of the damage inflicted to the body one day so that more damage can be done the next. Also not included are the energy demands of chewing approximately five times an average human’s daily intake of food! The ten stages of CCC are listed at left. To their right are the energy expenditures of four of the most insane training rides I’ve done in the vicinity of Edmonton. The first two are “PL2010″ and “PL2011″ which are 200 & 240 km training rides on my TT bike interspersed with intervals all the way from home to Pigeon Lake and back. “FullCM+” was Edmonton Road and Track’s ‘Full Calmar’ ride extended with a visit to Spring-Lake with added intervals to make it 230kms long. Finally “THawk” is a 180km Tomahawk loop ridden steady-tempo, the hilliest training ride that we have in the vicinity of Edmonton. The next three rides are from my Jasper Training Weekend “JTW:1-3″, done as preparation for CCC in Jasper National Park, trying to find as much sustained climbing as I could. Finally at right are four ‘event’ rides completed in the mountains. The first two are races at Ironman Canada in 2010 and 2011. Next up is a 300km ride over Highwood Pass and back, and the final ride, and only one in excess of 8000 cal is the Golden Triangle ride completed this past summer. Within the energy expenditure for each ride I have highlighted in red, the energy expenditure that plain physics demands to complete the ride is in red. This is the amount of energy needed to lug my body and bike over the mountain, nothing extra for aerodynamic drag or ‘going fast’, just the energy to complete. A full 18 hills on the Thursday Night circuit is about 700 calories for me and I’ll typically blow away another 800-1000 calories on a Thursday evening by doing it “fast”. Up to 60% of my energy on a Hills-night ride is spent going fast. On a long flat training ride, more than 85% of my energy is spent going fast. In the Pyrenees every day I was doing rides that were nearly as big as I could possibly do in terms of energy expenditure and less than 30% of my energy was spent going fast. The magnitude of effort required to complete the first stage of the CCC was about 50% more than was required to complete the Golden Triangle. We then did the same thing the next day… and the load just piled on with basically no respite until the end (if you can call those days respite. Stage 9 had abnormally low grades (only 7 or 8%!) on two of the passes because we were in Spain so the mileage was high but the climbing low. Stage 10 was slightly abridged so that we could finish with time to pack bikes before a celebratory dinner of pork cheeks and some fine Catalan red wine. I’ll also post the following chart, displaying the average work rate in calories burned per hour (stipulations as above regarding the many calories that are ignored). It shows that on average the intensity of these rides was on the low end for something I’d be able to sustain for an incredibly tough training day at home. This is for two reasons, the first is that when I plan a ride that is as hard as I can possibly handle at home I normally have at most a moderate day before and a moderate day after, never another that is similarly difficult. The second reason is that about 50% of the mileage completed in the Pyrenees was done while descending. The roads are technical on the descents and generally it’s irresponsible to pedal because you’re trying not to gain too much speed so that you don’t overheat your brakes and destroy your wheels. Those descents provide a good opportunity for digesting food at a lowered heart rate, so while the chart indicates that on average the day-long work rate is lower, the up-hill work rate is higher (up to 25% higher = comparable with age-group winning IM average effort) and the down-hill work rate is essentially zero with a few exceptions. I hope these charts give an idea of how hard is hard. I rode 86 hours and 15 minutes over the course of the 11 days on the trip but I think that’s possibly the most misleading metric for how hard the challenge was so I don’t think I’ll mention that stat again. It was hardly about the time, it was all about the quantity of work that needed to be done and so hopefully this has given an illustration of how much work that was. I’ll just make one last reminder that we did all 10 of those rides in the course of just 11 days.